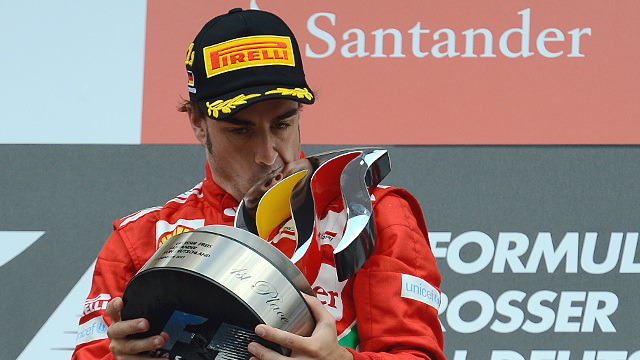 This is F1Minute - Ferrari pick up third victory in 2012, as Alonso wins at Hockenheim. Sunday at Hockenheim was gloriously sunny, completely at odds with the two days that had gone before. Fernando Alonso got a great start, converting his pole position into a sizeable lead in the first stint. His Ferrari teammate Felipe Massa clipped the rear of another car at the start, though, and had to pit for a new front wing. Romain Grosjean also stopped for a new nose, after colliding with Bruno Senna. The Williams driver had to come in for an early stop due to a puncture. Lewis Hamilton also developed a puncture after running over the debris from Massa’s flying front wing - he lost a bunch of places, struggled to get comfortable in the car again, and eventually retired from the race. Meanwhile, towards the front, Jenson Button improved on his sixth place start to slot into second behind Alonso. He lost second to Sebastian Vettel on the penultimate lap, but the Red Bull had overtaken with all four wheels off the circuit. Vettel was later penalised 20 seconds, dropping him from second to fifth. Button finished second, therefore, with Kimi Räikkönen - who had put on a fantastic show all afternoon - finishing third.